Roasted turkey legs are a favorite in many families, and they are easier to prepare than you might think. 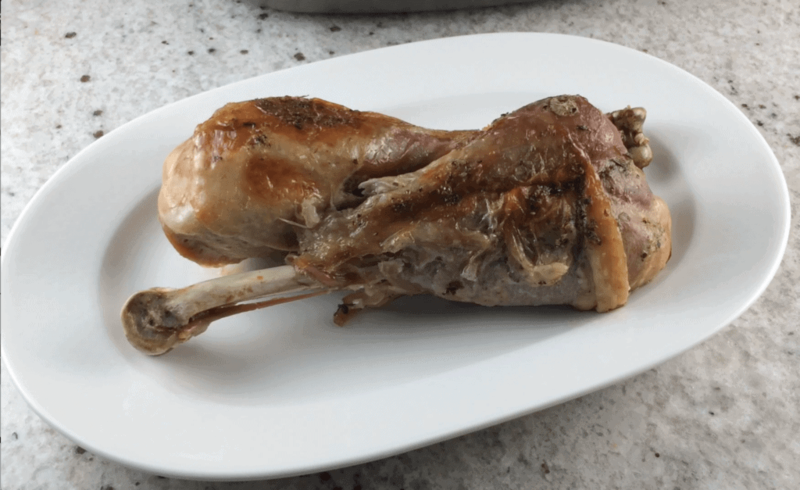 This recipe and step by step video shows you how to make these delicious turkey legs, whether for Thanksgiving or any other special occasion. Kids usually are huge fans of this juicy treat, especially if you allow them to devour them with their hands, caveman style. See the complete recipe below, so you can print it out and have it handy. In a food processor, combine butter, garlic, herbs to form a creamy herb butter. Peel away the turkey legs' skin and insert some of the butter mixture between the skin and the meat. Now apply the herbed butter with a brush all over the turkey leg. Put an oven bag inside a dutch oven and then add the celery, carrots and onions inside of the bag . Put the turkey legs inside the bag on top of the vegetables. Tie the bag and bake the turkey for an hour and thirty minutes. Tip: put the dutch oven in the middle. Take out of the oven, carefully untie the bag so the vapor does not burn you and allow to cool for 10 minutes. Serve the turkey legs without the vegetables. Find more recipes on our YouTube channel.